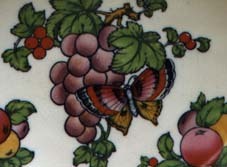 This colourful pattern features handpainted fruits and berries with two butterflies, in green, purple, ochre, orange, light blue over a dark blue transfer. The items shown below have a white ground. 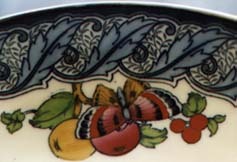 Dark blue transfer with green, purple, pink, orange, yellow and light blue, gold rim. 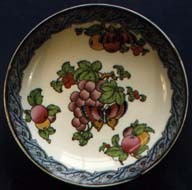 Dark blue transfer with green, purple, ochre, orange and light blue, gold rim.